As a property manager or landlord, there are many things you need to do to get your property ready to show to prospective renters. Having your property "rent ready" means that it has been cleaned, repaired, and that it's in rent-able condition for new tenants. A rent ready house appeals to more tenants, meaning it will rent faster and for a higher price. Prospective renters often decide whether to look inside a house based on its curb appeal or what they see in online photos. Consider taking photos of the home to help you spot problems or areas for improvement. Re-key all the locks both indoors and out without forgetting the side doors. Change the garage door and alarm codes. Remember often overlooked locks too: mailboxes, side gates, outdoor sheds. Re-keying and recoding locks makes the old keys unusable - which is important since you never know who may have a set of your old keys or codes. Don't forget about the locks and keys you don't need to change, your new renters will need all HOA-issued gate remotes and codes, plus keys (and codes) to any community pools and fitness centers. Have all the carpets cleaned. A professional "full-steam and shampoo" carpet cleaning works best, this ensures that you won't have any residue left because it can attract dirt. Enhance your property's curb appeal. Cutting the grass, trimming the bushes and trees, pulling the weeds, fixing broken sprinkler heads, replacing dead shrubbery, and adding some new seasonal flowering will go a long way to making your rental property attractive and inviting. Clear away old flower pots, yard furniture and garden decorations. A power washer works great for removing any dirt from the cracks in the sidewalks and patio. Also, keep your lawn well-watered and healthy. After finishing the yard work, check the fence for needed cleaning, repairs or paint/stain needs. Next, clean and repair gutters as needed, and finally, make sure the property number is easily visible both day and night. Potential renters will be unable to rent if they are unable to easily locate your rental. All air filters will need replaced. While you're replacing filters, go ahead and clean the vents as well. Also, consider replacing any reusable air filters with disposable ones that won't require monthly cleaning. Clean the entire rental top-to-bottom. Renters expect their rental property to be clean for move-in, so have the property professionally cleaned. 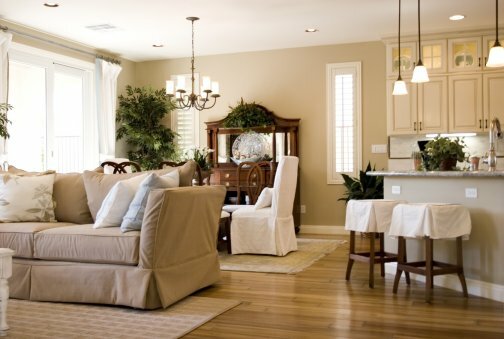 Professional cleaners can get every area of your property clean. Don't forget to have appliances cleaned (refrigerator, ovens etc.) Beginning with a thoroughly clean rental will help your tenants have a new welcoming home, but will also help you when they move out. If they fail to clean to your specified standards, their deposit can help with any cleaning fees you accrue after they move out. Also, be careful to remove any lingering odors. Do what you can to brighten up your space. Draw back any heavy window coverings, but feel free to leave any sheers that let light in, in place. When you're replacing any broken or burnt out light bulbs, replace them with energy-efficient bulbs, which reduce energy costs and don't need to be replaced as often. Don't forget about the exterior lights! Replace broken or burnt out bulbs and wipe down the fixtures. Brighter is better for outdoor security, and removing dirt and debris will help with this. Make sure that all fans (indoor and outdoor) operate properly and are dust-free. Check that the blades don't wobble when spinning. If they do, you can purchase ceiling fan balancing kits at just about any hardware store. Repair or replace (if needed) any windows and doors. Sliding glass doors can easily build up dirt. A good cleaning will let in more light, and may help them work better. Don't forget screens! Clean and repair screens as need as well. Keeping screens in good repair can save you money on down the line by helping keep bugs out. It's better to have the property sprayed on a regular schedule than to wait until there's a pest problem. Having this done while there are no tenants will be move convenient for everyone and can easily save your money by preventing more costly repairs later. Check all flooring and walls. You will need to fix any holes in the walls before painting. A fresh coat of paint will give you a lot of bang for your buck and help your rental have a "fresh and new" feeling to it, which is very appealing to prospective tenants. Replace any damaged carpet or areas that didn't come clean during your professional cleaning. Don't forget any tiled areas and fix or replace broken tiles as needed. This is also a good time to have your fireplace and chimney inspected, repaired and cleaned. Make sure all smoke detectors and carbon monoxide detectors are working and replace batteries at this time. Also, test the plumbing - toilets, faucets, shower-heads etc. to check for leaks or drips. Catching small plumbing problems before they are big plumbing problems will help you save big down the road. Outlets also need tested to make sure they are functioning properly as well.